Running Press Kids, 9780762462667, 40pp. 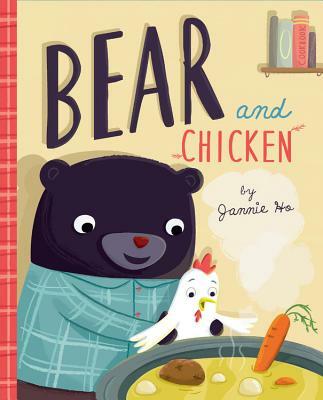 Humor, a surprise ending, and an unlikely friendship make Bear and Chicken fall into the ranks with Mo Willems and Dev Petty, and the soup recipe at the end will inspire young chefs to get into the kitchen and cook! When Bear finds a chicken frozen in the winter snow, he brings it home to try to defrost it. As Chicken thaws-um, awakens-he fears that Bear is actually prepping to eat him. Oh no! All signs are pointing to a fateful end for Chicken-being wrapped like a burrito, chopped basil and veggies sitting on the counter, the huge pot on the stove that's just the right size for a chicken to fit inside. It's almost time for lunch, so Chicken makes a run for it! But in the end, Chicken learns that perhaps he too quickly jumped to conclusions. This funny and clever friendship tale teaches kids that things are not always as they seem, while learning a thing or two about making soup with a friend! Jannie Ho has a BFA in illustration from Parsons The New School of Design and has been an in-house graphic designer at Nickelodeon and Scholastic, as well as art director for TIME Magazine for Kids. Since 2006, she has been doing illustration work full time. Jannie lives in Boston, MA.